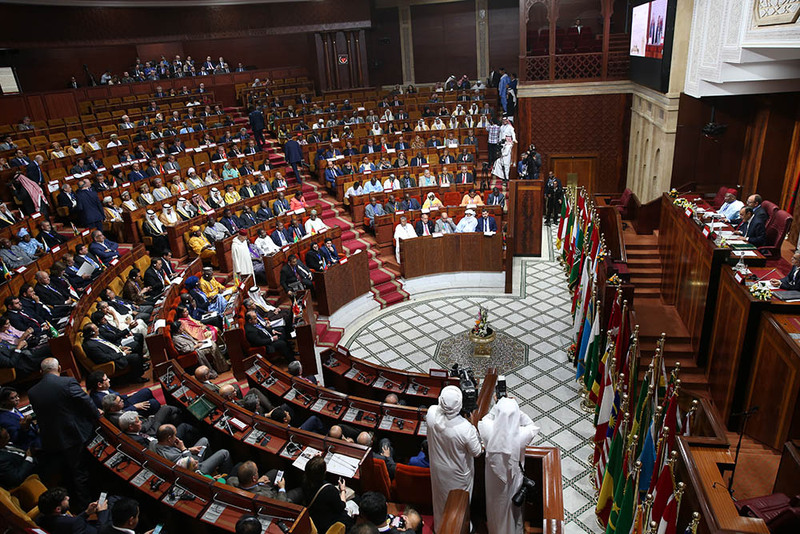 Speech of the Speaker of the House of Representatives at the 14th Session of the Parliamentary Union of the OIC Member States, which has been held in Rabat, on 14 March, 2019. 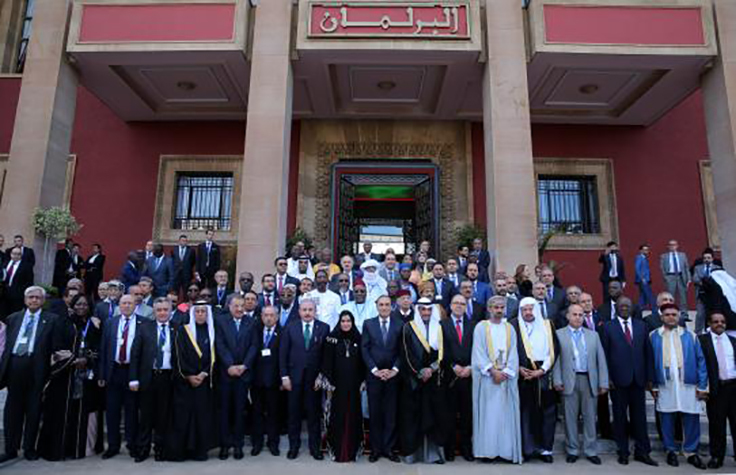 I am delighted to open the proceedings of this 14th session of the Parliamentary Union of OIC Member States, which is being held under the high patronage of His Majesty King Mohammed VI. This reflects the keen interest His Majesty takes in the issues of the Islamic world and the special attention he attaches to our Union. I should like, first of all, to welcome you to the Kingdom of Morocco and to wish you a pleasant stay among us. I hope this session, held in Rabat, will make a qualitative contribution to the ideas developed by the Union and to its action and initiatives. I would be remiss if I did not thank the Union’s President, the Secretary-General and the staff working with them for their efforts to develop the work of our Union. 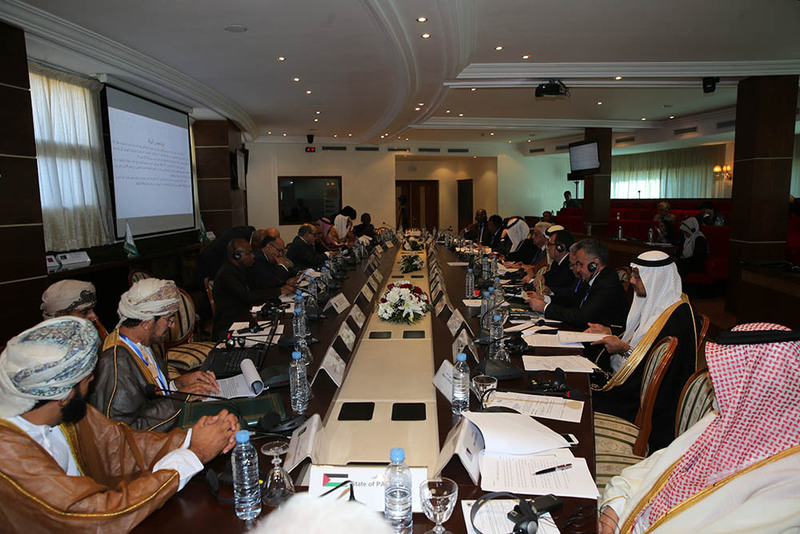 Our conference is taking place fifty years after the founding of the Organization of the Islamic Conference (OIC), pursuant to a resolution adopted by the historic Summit held here, in Rabat, in September 1969, following the criminal arson of the Al-Aqsa Mosque in occupied Jerusalem, at the hands of Zionist gangs. This conference is taking place in a complex international environment which is compounding the magnitude as well as the seriousness of the challenges plaguing many parts of the globe, including the Islamic world. 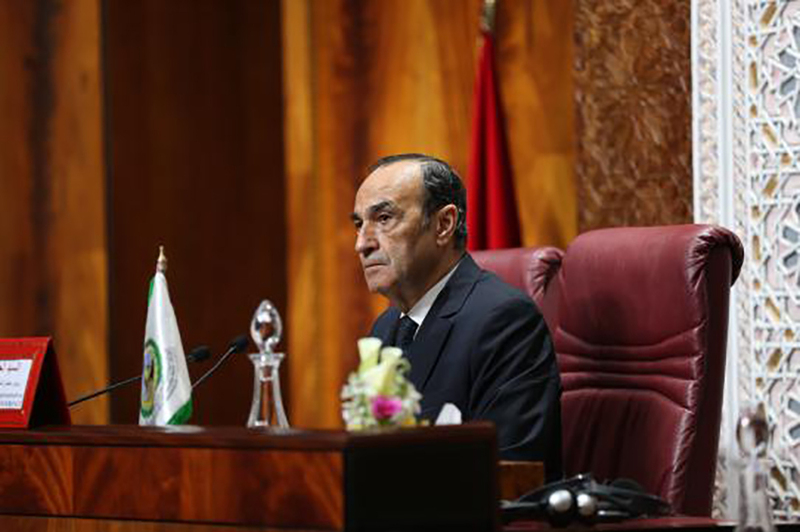 We, in the Moroccan Parliament, consider that the convening of this session in Rabat, under the high patronage of His Majesty King Mohammed VI, is a recognition, by our Union, of the role the Kingdom is playing in the Islamic world. His Majesty the King wanted this session to be held under his high patronage as a token of the high regard in which His Majesty holds the Union and in appreciation of the roles expected from it. The members of our Union still recall, I am sure, the historic speech delivered by His Majesty at the opening of the second session of our Parliamentary Union, held in this conference hall on 27 and 28 September 2001. That conference established the foundations of what was a fledgling body at that time, as our Union sought to play a central role as one of the institutions of joint Islamic action. I think it is befitting to take the opportunity of this opening session to recall the sincere and worthy efforts His Majesty has been making in his capacity as Chairman of the Al-Quds Committee to end the Israeli occupation of the Holy City, protect Islamic holy sites there and support the steadfastness of the Palestinian people in Al-Quds as well as in all occupied Palestinian territories through concrete, qualitative projects carried out by the Beit Mal Al-Quds al-Sharif Agency. We wish to express to His Majesty the King our deep appreciation and gratitude for all he has been doing to contribute to the progress and development of Muslim countries and communities. The latest example was His Majesty’s approval of the appointment of His Majesty’s sister, Her Royal Highness Princess Lalla Meryem, as Goodwill Ambassador in the field of defending the values of the family and the marriage institution and combating underage marriage. This is one of the societal problems that are turning into major issues in the Islamic world. Through that assent, His Majesty is sending out a signal to underscore the crucial importance of social and family cohesion as well as the important part the family plays in building resilient, capable societies in today's world. As I pointed out earlier, Islamic countries are still facing serious challenges which are constraining their development and progress and undermining their human, material and intangible wealth. No doubt we agree here, just like our peoples and governments, that the greatest, long-lasting challenge we are confronted with is our inability to achieve the legitimate rights of the brotherly Palestinian people to liberate their land, establish their independent State, with Al-Quds (Jerusalem) as its capital, and ensure the return of refugees to their homeland. Every single day, the suffering of the Palestinian people is compounded by the practices of the Israeli occupation and its encroaching on the land of Palestine. Settlements and the confiscation of Palestinian land and property are undermining any prospects for a just solution to the Palestinian-Israeli conflict. The Israeli Segregation Wall is turning the lives of Palestinians into a daily ordeal. Similarly, and as a result of the Israeli blockade, the Gaza Strip is now a geographical area in which daily tragedies are playing out for more than two million Palestinians. The occupation authorities have been implementing an increasingly vicious policy of killing, repression and detention against the Palestinian people, taking advantage not only of unprecedented instability in Palestine’s broader Arab and Islamic environment, but also of a skewed international balance of power. I should like to take this opportunity to stress that it is inconceivable that the Palestinian people should have made huge sacrifices and waged a long, bitter struggle for nothing. Their right to their State, to their land and to the use of their territory is inalienable. In addition to the historical challenges we are facing and the responsibilities we bear as Islamic countries that are convinced of the need for justice and peace towards Palestine and its people, who have been suffering from a historical injustice for more than 70 years, there are other conflicts raging in several parts of the Islamic world. I think it would hardly be an exaggeration to say that this geopolitical area is, today, home to the largest number of destructive conflicts. They are also the broadest and most costly conflicts, which have impacts on inter-Islamic relations, on development, on human communities and on the future. These conflicts entail severe social and humanitarian consequences, the most significant of which are migration phenomena, mass exodus and deprivation of large segments of the population of the most basic needs, particularly a ruined future for entire generations, who bear no responsibility for the frustration and hopelessness they are suffering from, and which deprive them of a dignified life. In a number of Islamic countries, this phenomenon is aggravated by unprecedented climate disruptions, which compel large segments of the population to leave their countries. In connection with the above challenges, we are all facing the scourge of terrorism and extremism from which most Islamic countries have suffered or are suffering. This is a phenomenon which feeds on conflict, on despair, on discourses and ideologies based on incitement and refusal of difference, progress and development, even life and its beauty. As the philosopher Ibn Rushd said, the greatest enemy of Islam is an ignorant who makes disbelievers of the people. Our fight against terrorism and extremism is a common one. They represent a threat to our collective security and stability. I believe it would not be chauvinistic to say that the Kingdom of Morocco stands out as a successful and effective example in the fight against terrorism. This is due to the adoption of a three-pronged moderation policy based on the training of imams and preachers, effective security measures in keeping with rule of law, and the fight against social vulnerability, which provides fertile ground for terrorist groups. 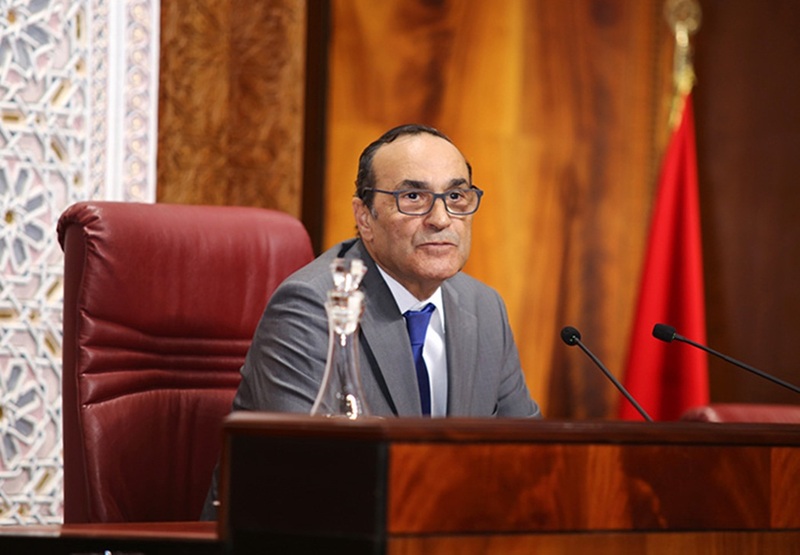 This policy is facilitated by the Moroccan people’s commitment to openness, moderation and tolerance, and in particular to the historical role of the Commandership of the Faithful. We are proud, today, to share this experience and this approach with a number of sister Islamic nations and with friends and allies in the collective battle against terrorism. Making sure Islamic countries succeed in offering inclusive education that provides knowledge and cultural enlightenment and serves as an instrument of openness and social advancement is a common challenge for most Muslim countries. The command of information technology and its use in the service sector, in the economy, in culture and in the facilitation and transparency of dealings and transactions are an immediate, objective and urgent expectation of our peoples, especially our youths. They require investing in our young people as much as in scientific research. I am sure we share the same appreciation concerning the wide gap between our societies and the countries with a solid command of science and knowledge. This is a key sector which opens up vast prospects in terms of economic added value and the modernization of the economic and service infrastructure, in addition to employment that preserves dignity, for which millions of our young people are yearning. These challenges entail many responsibilities for Islamic parliaments. The latter are expected to promote democracy and to enhance people's confidence in their institutions. This can be achieved only through greater democracy, respect for human rights, the consolidation of institution-based states and enabling peoples to embrace those institutions by ensuring their participation in decision-making and in the good governance of public policies through their representatives. To be sure, this cannot be imposed from the outside. Rather, it must be a free, voluntary and gradually implemented choice that builds on achievements and takes into account the history and specific characteristics of each country. Nonetheless, it certainly remains both a popular demand and a historical necessity. Democracy is not a luxury. It is a necessity in community life because it contributes to stability. It is also a universal demand. It goes without saying that democracy enhances social and internal cohesion in each country; it also reinforces nation states that are open onto their immediate surroundings and beyond. In this globalized international environment, conflicts and crises should be resolved, borders between Muslim countries should be made safe, and bridges for human interaction and economic cooperation and exchanges should be encouraged. Indeed, not only is the cost of internal and cross-border conflicts very high, but those conflicts also impede progress and development. Our countries’ potential for development is clearly enormous. Whether it is human resources, skills, manpower, natural resources, markets or geographical location, few geopolitical groups can compete with the countries of the Islamic world. Naturally, we need wisdom, dialogue, listening to one another and political will; we need to respect one another, refrain from interfering in the internal affairs of others and respect the territorial integrity and national sovereignty of each country, and each nation must coexist and reconcile with its regional environment. These are universal principles we ought to respect lest we become victims thereof. We are at a crossroads in the history of the Islamic world. The situation is compounded by the unfair and inaccurate stereotyping of Islam and Muslims, which itself feeds on the inexcusable acts of terrorism perpetrated by some perverts in the name of religion. As His Majesty King Mohammed VI said in his address to our Union eighteen years ago, right here under this dome, we, as representatives of the peoples, are at the forefront of those who can refute the claims of those who characterize Islam as a radical, violent faith, exploiting the acts of those who deviate from its lofty values. By letting the historical opportunities available to us slip by, we are squandering precious political time in what are decisive, crucial junctures in our history. We should ask ourselves the question about the economic, social, political and strategic cost of those wasted opportunities, and we must draw lessons from that. Regardless of any differences we may have in our assessment of that cost, we are called upon, in managing disputes, conflicts and crises, to make wisdom, reason and the logic of common interests prevail – above all our peoples’ interests with respect to stability, security, development and prosperity. Our peoples no longer stand polarizing conflicts, dissonance and the wasting of resources on wars and conflicts – in fact, we have everything it takes for a new revival. Our true Islamic faith calls for tolerance, coexistence and dialogue in dealing with the other. Today we must strengthen and enhance this approach by promoting this dialogue in order to safeguard stability, peace and security. 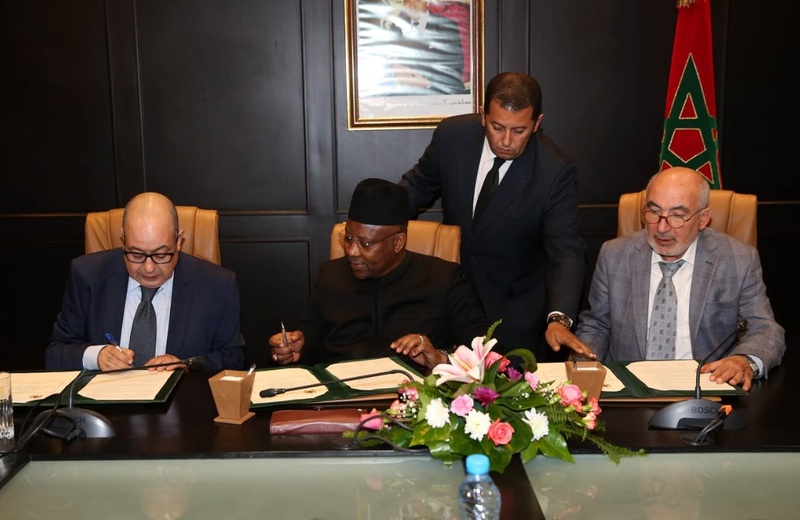 We reiterate our readiness, in Morocco, to engage in all initiatives and programs our Union will adopt at the parliamentary level to help resolve all conflicts and tensions and serve peace, based on justice and equity. Today, we need dialogue more than ever before. Indeed, there is no alternative to seeking peace, stability and security; nor is there an alternative to cooperation, solidarity, tolerance, progress and shared prosperity.